Bright and stylish Rainbow 2L PLUS microscopes are the logical continuation of the Levenhuk Rainbow 2L series. New microscopes combine all the advantages of the previous line with new, favorable features. These microscopes are equipped with two illumination systems – that means you can observe transparent, semi-transparent, and opaque microscope samples. Each model comes with a Levenhuk K50 Experiment Kit – this kit will help young researches with their first independent experiments and research. The main difference of the new microscopes is their improved optics. They produce higher magnification power (up to 640x) and can be used for serious research by biology students. All microscopes are equipped with a spring-loaded objective lens – its design prevents any damage, even if the objective touches the slide during the focusing process. 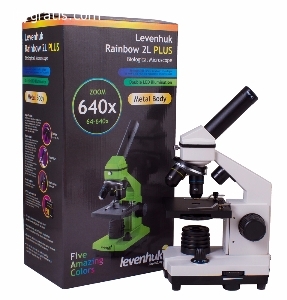 Levenhuk Rainbow 2L PLUS microscopes have reliable metal bodies – they are known for its long service life even when used intensively in colleges or laboratories. 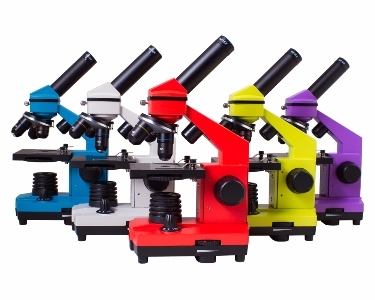 And, of course, we should mention their modern design and five bright body colors – one of these beautiful microscopes will look very nice in your child’s room or on your desktop.